For almost-real-time statistics, visit the Transate site. Choose the desired language, refresh the page, and you're done! 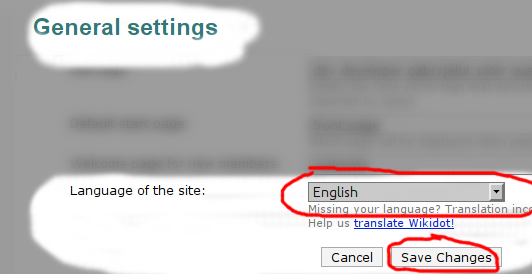 In case the translation is not what you expected (not complete, has mistakes), you can go back and select English, but we suggest that you should go to translate.wikidot.com and improve the translation instead! Any translations you make there will be shown on your site soon afterwards. However, the work is not over. Missing translation of sentences. Brunhilda already told that. I started, a long time ago, a mockup of a multilingual doc at http://babel-doc.wikidot.com/fr:modules, based on the first version of James Kanjo's http://doc.wikidot.com/module:_start, but with categories for languages. See also http://doc.wikidot.com/syntax:_start where syntax elements are hosted on their own pages. So, what are your thoughts on this ? good job, guys! i'll hopefully start on the (brazilian) portuguese version soon. Just thinking out loud a little… With this wiki, interactive way of translating Wikidot's interface, it seems it would be much easier to create websites in minority languages (by which I mean really tiny speech communities, as it is the case of most indigenous languages in Latin America). Is that a unique Wikidot feature? I remember, a few years ago (before I came into Wikidot), I was contemplating the possibility of creating an encyclopedia in Karajá (an indigenous language spoken by around 3 thousand people in Brazil) but was discouraged by the fact that the interface would still remain in Portuguese. If one can translate the interface into any language, no matter how "small", that is certainly great news! Having sites translated into such indigenous languages would make Wikidot rather special. On a slightly large scale than the Karajá language, I am tempted to start a (Scottish) Gaelic translation as about 65000 speak it, but I don't think I speak and write it well enough yet so it will probably have to wait a year or so. I don't really know what to think about such languages, I doubt those languages are nowadays someone's primary language. In case they are, they are primary ex aequo with other popular languages like English or Spanish. If this IS the case, I don't really think the effort to maintain those languages is worth it given the people it's done for can naturally speak other languages. Is it worth or not, it's more or less possible on Wikidot now, so why not try and see what happens :-). I think I can reveal, we're going to make also dialects possible on Wikidot. For example: language pt_BR, which would be a dialect of language pt in a way that in place of non-translated messages pt translations would be used (then original English ones). This should solve the issue with languages without a proper ISO code, like pirrrrrate or 1337 dialects of English. :) indeed. With all the different dialects, regional accents and irregularities it always amazes me how well the rest of the world is able is able to speak, read and write English. Don't wait! And make your users involved. > 1337 dialects of English. 1337 = LEET = Writing English using numbers instead of letters. What does the 1/1651 mean? And where is a list of phrases to be translated? Phrases to translate are split based on the first letter (word "The" is removed from texts before determining the first letter though). Click any of the letters to start translating! It is now about 47/1651 … means 47 phrases of 1651 are translated..
And where is a list of phrases to be translated? create the page by saving it. 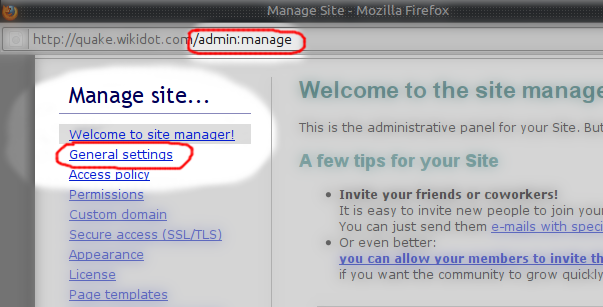 There are open phrases to trasnlate now (a lot) in the "my_account" and "Site manager" part. 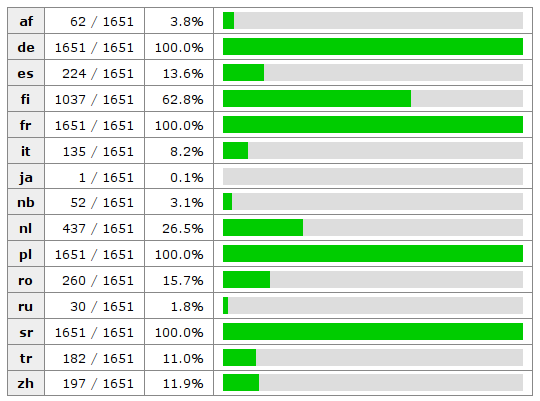 which I beleive are more hardcoded and need more time to split out in external storages… ( but please - append them at the end of the existing phrase-pages - otherwise all following non-english-sentences are cleared out again and we have to translate them again…( ok, the history helps here). My question to the doumentation is the next step forward to ask the community worldwide. Edit: I have created the 2 examples on the 2 sites without changing the start page - only for demonstration . Therefore I created in the community the page http://community.wikidot.com/syntax-changes - a try to summarize "important" changes for teh readers.